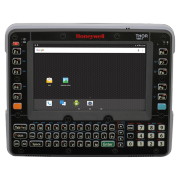 The forklift terminal Thor VM1A was designed by Honeywell for the challenging tasks in warehouses, logistics and intermodal transport. It has an exchangeable 8'' WXGA LED-backlit touch display (resistive or capacitive) and a keyboard with function keys. The display is also available as an indoor/outdoor variant with 400/900 nits – or as a resistive variant with an integrated defroster for usage in cold environments and cold storage. The forklift terminal is equipped with the newest Android operating system, giving your customers all the benefits of the Mobility Edge platform: less integration effort, lower costs and extra-long flexibility. The Thor VM1A is certified according to IP66 and MIL-STD-810F standards. A Qualcomm 660 Octa-Core processor with 2.2 GHz, 2x2 MIMO WLAN, Bluetooth 5.0 and NFC ensures for good performance and the best possible connection. Thanks to the clever smart dock bracket, your customers move the Thor VM1A from one vehicle to another during operation in a single step. The powerful battery bridges all connections and applications for up to 30 minutes. Order the forklift terminal Thor VM1A with your sales representative. Give us a call today!